The Jet Blasterz range takes an old tried and tested kids toy and brings it into the 21st century. The old catapult launched plane format has been improved upon. 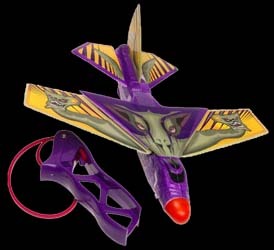 Now, instead of simply launching the plane into the air, Air Hogs Jet Blasterz' range allows the plane's wings to be folded away for the launch so that it climbs to a greater height. Once it has reached a certain altitude, the wings gently unfold and the plane glides to earth - or does somersaults, if you have altered the plane's flaps. The first impressions of this model were not overly impressive. Once out of the pack, we noticed that there were several bits of sticky tape that were hanging loose from the plane (these stick the polystyrene wings to the plastic wing structure). This made it appear badly constructed. However, upon launching it we found this to be great fun. It soars to an impressive height before gliding back to earth - you'll need a wide, open space to fly this in. Sadly, no matter how careful you are with it, it won't be long before the wings are too damaged to fly it as well as when you first get it out of the box. After about two hours, we noticed that the plane started flying erratically - nose-diving for no apparent reason or spinning uncontrollably to earth. We tried straightening the wings, and ensuring all flaps were level, but nothing seemed to sort this problem out - a problem which made the plane unflyable. Still, £6 for over two hours fun is not bad value for money and I would certainly consider buying another model to experience the same enjoyment again. Cheap and cheerful, these models are good value for money.